3 Bedroom, 2 Bath Clean Home, In A Beautiful Private Setting. The house in set at the edge of a fruit orchard and surrounding pastures. The house accommodates 6 persons, a king bedroom with an attached bath, a queen bedroom and a bedroom with twin beds. These two rooms share a bathroom each with their own door . There is a large living room, a well setup kitchen, with everything to make great meals in house, a lanai to sip a glass of wine on when you come home from exploring the island and a yard for the kids to romp in while you relax. 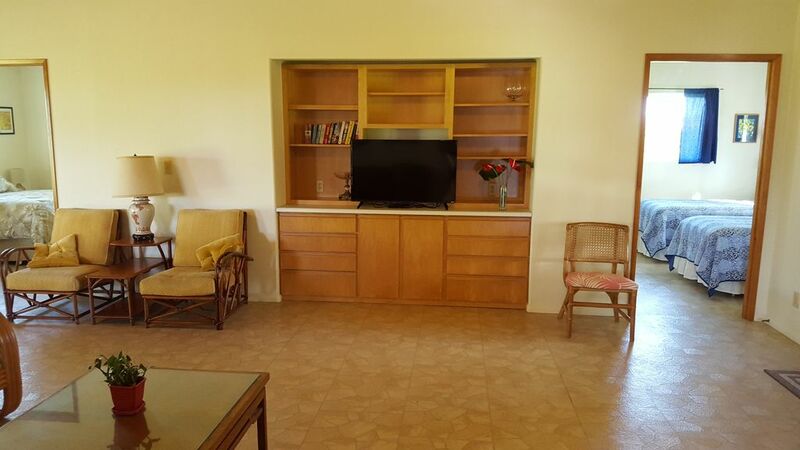 The house has wifi and TV and, we hope, all you need while vacationing on our island. We are tropical fruit farmers and owners of Plant It Hawaii, fruit tree nursery. We have been farming on island for about 40 years. My husband and our daughter ride horses and enjoy team roping together. I am an avid walker and love to swim at dawn in the blue Pacific. I also enjoy drawing and painting. We love to camp and to travel and when we travel we use VRBO or Homeaway as our home base. We provide a clean and comfortable house with everything you need and want to make your stay like home. We built this house for Bob's mother to live in as she aged. The house is wheelchair accessible and spaciously designed for ease and comfort. We live close by and share the same driveway, though it is difficult to see to one house from the other. The two houses sit on about 35 acres., with orchard and pasture, and a stunning views of the sunrise and sometimes of the Volcano glow. We love this quiet area, the open space and the ease to the highway to zip to town or visit the Volcano for a day hike or a week-end camp-out. The bathroom attached to the King Bedroom is small. It is well stocked and has a shower and tub in Combo. The bathroom attached between the two other bedrooms is spacious, and is wheelchair accessible. The shower has a small lip (4"). Of course all towels, soap and other necessities are in stock. Scenic farm setting with fruit orchard, horse and cow pastures and often a view of the Volcanic glow. Set between Hilo (10 miles) and Volcano (15 miles) and less than half a mile of paved road to HWY. Fresh clean linens are always provided at the beginning of your stay. At present (August 2016) all beds and linens, towels etc. are brand new. The house is protected by a private gate operated by a remote, given to you upon check-in. There is plenty of parking, including for one or two, depending on the car size in the covered carport. WiFi is available at the house. It is dependable but not fast....so can be frustrating when streaming. Fresh clean towels are always provided at the beginning of your stay. At present (August 2016) all beds and linens, towels etc. are brand new. A large full size refrigerator with a top freezer and ice maker. There is a standard electric "Mr. Coffee" machine, with the filters. There is a "French Press" pot, along with a grinder. There should always be enough coffee and tea for the first few days. The house will have some coffee, tea, sugar, soy sauce and rice, as well as some oil and spices. There are dishes and glasses and flatware for 12 people. The house also has all the cooking utensils needed for preparing most any type of meal. There is comfortable seating inside for 6 or more, and on the lanai for 4 or more. There is also a fold out table ( a bit heavy) that can be set up for games or more dining area. Feel free to take a book or to leave a book. Enjoy reading! The house was built with wheelchair accessibility in mind. There are still little lips and such that some specific wheelchairs may have difficulty with. The door widths are large enough and spaces large enough, and a counter was built at wheelchair height. We enjoyed staying in this house very much. The house is located in a beautiful orchard that is only about 6 miles from Hilo, on the way to the Volcano National Park. The house has three bedrooms and a large living room. It is much larger than other vacation homes we lived before. The owner is very nice and patient. Susan patiently answered many questions before our visit. Upon our arrival, she provided newly picked fruits from her orchard and showed us the best locations to see sea turtles on her ipad. We would highly recommend this house. Beautiful house with wide assortment of commonly needed items. Very nice and clean, well equipped. Our second time here and we plan to stay there regularly whenever we visit Big Island. A couple of items needed fixing; agreed with owner these could be deferred until after our visit. Owners were very hospitable. A peaceful setting, private with pastoral views. Our HOME AWAY FROM HOME! The house itself was spacious, clean and well-designed. It was well supplied, with extra, thoughtful touches. We enjoyed being together in the family friendly dining area and out on the lanai, but had our own space when we wanted solitude. The large backyard orchard, including fruit on the trees, was magical. This was our second stay here, and we hope to come again. Friendly, accommodating owners, Susi and Bob who were responsive to our every need. Even sent their daughter to help remedy an email issue that we had. Home is spacious and comfortable. Although the house is not air-conditioned, this was never a problem as there was always a beautiful cross breeze. We were greeted with a fresh tray of fruit and freshly squeezed orange juice straight from their orchard. The home is situated close to Volcano Park (only a half hour away). Also close to Hilo. perfect for us as we wanted something away from it all, yet convenient to Hilo and the volcano. Susi was great, went out of her way to be accessible and insure our comfort. We are located less than 30 minutes from Volcanoes National Park, where our Volcano has been active since 1983. Our Park is essentially a "Volcanic Drive-Thru", where you can walk in lava tubes, hike in craters and enjoy the diverse and raw Hawaii. At the moment (August 2016) the lava is pouring into the ocean making a new black sand beach. Viewing is possible by hiking, bicycling and/or by boat. I daily enjoy a swim in the blue Pacific at Richardson Beach Park in Keaukaha in Hilo. The snorkeling is great there and it is a protected ocean bay; perfect for swimming, boarding, stand-up paddling or other ocean side activities. There are several beaches along the Keaukaha peninsula that provide various favorites for beach goers.